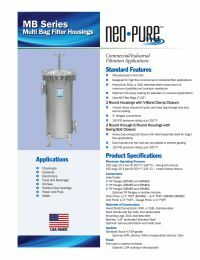 Neo-Pure Stainless Steel SBMB3X2 Housings provides excellent filtration with three #2 bag filters for flow rates up to 525 gpm. The swing bolt closure is ideal for large flow systems. NOTE: Standard option MB series housings are in-stock and ready to ship. Customized versions will require a 2-3 week time for customization and manufacturing. For more information on returning customized items, see our Returns Policy .